In 1862, U.S. Congress passed legislation to establish a national network of colleges devoted to agriculture and mechanics. Known as the “land-grant” system, each state received an allotment of federal land to pay for its new school. Wisconsin received 240,000 acres and sold them for $1.25 per acre. The state legislature opted to direct those funds to the new University of Wisconsin in Madison to carry out the land-grant mission. Today, the College of Agricultural and Life Sciences continues to fulfill UW–Madison’s mission as a land-grant university. 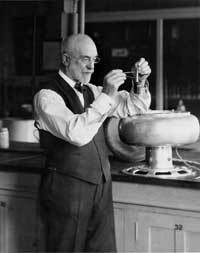 Agricultural chemist Stephen Moulton Babcock is known for inventing a test for measuring the butterfat content in milk (shown here) as well as for the single-grain experiment, which led to the development of the field of nutrional science. While the college itself wasn’t officially established until 1889, the seeds were planted several decades earlier. In the 1870s, the university used $40,000 donated by Dane County to purchase a farm west of campus and established a department of agriculture. In 1880 W.A. Henry was hired and he spent the next 17 years creating CALS programs, many of which still exist today. In 1883, the state legislature established the Wisconsin Agricultural Experiment Station, the foundation for today’s world-renowned research program. In 1885 the university began offering a course for farmers in the winter, a program that continues today as the Farm and Industry Short Course. The same year saw the beginning of a program called the Farmers Institutes, a sort of traveling school of agriculture for farmers that met at various locations around the state. This was a precursor to today’s Cooperative Extension and other outreach programs. In 1889 the university put all of these agricultural offerings under a new College of Agriculture, with Henry as dean. The college has evolved and grown over the decades to reflect changes in the fabric of society and in the areas of knowledge that it studies. Practical studies related to crop and livestock production and farm life gradually delved deeper as scientists strove to understand the underlying biological processes. Today the college generates new knowledge about agriculture, natural resources management and protection, human health and nutrition, community development and related topics. Faculty and staff in 17 academic departments and a number of interdisciplinary programs carry out these lines of study..